Live Media video conferences send and receive high quality video and audio between multiple endpoints. Choose from one of our convenient webcast packages below! Choose this package when you need the hardware onsite at your location to communicate with other locations. Choose this package when you need hardware at your location as well as the ability to see and hear other locations. Need more information on video conferencing? Click here. Not what you’re looking for? 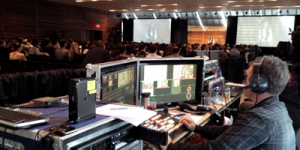 Try Live Media Webinar Services or Webcasting Services. High Quality Video Conferencing at Affordable Prices.